The temporary closure sets in motion the largest overhaul in the telescope's history and sets the stage for the installation of the Dark Energy Spectroscopic Instrument (DESI), which will begin a five-year observing run next year at the National Science Foundation's Kitt Peak National Observatory (KPNO) - part of the National Optical Astronomy Observatory (NOAO). "This day marks an enormous milestone for us," said DESI Director Michael Levi of the Department of Energy's Lawrence Berkeley National Laboratory (Berkeley Lab), which is leading the project's international collaboration. "Now we remove the old equipment and start the yearlong process of putting the new stuff on." More than 465 researchers from about 71 institutions are participating in the DESI collaboration. The entire top end of the telescope, which weighs as much as a school bus and houses the telescope's secondary mirror and a large digital camera, will be removed and replaced with DESI instruments. A large crane will lift the telescope's top end through the observing slit in its dome. Besides providing new insights about the universe's expansion and large-scale structure, DESI will also help to set limits on theories related to gravity and the formative stages of the universe, and could even provide new mass measurements for a variety of elusive yet abundant subatomic particles called neutrinos. "One of the primary ways that we learn about the unseen universe is by its subtle effects on the clustering of galaxies," said DESI Collaboration Co-Spokesperson Daniel Eisenstein of Harvard University. "The new maps from DESI will provide an exquisite new level of sensitivity in our study of cosmology." The Mayall Telescope has played an important role in many astronomical discoveries, including measurements supporting the discovery of dark energy and establishing the role of dark matter in the universe from measurements of galaxy rotation. Its observations have also been used in determining the scale and structure of the universe. Dark matter and dark energy together are believed to make up about 95 percent of all of the universe's mass and energy. It was one of the world's largest optical telescopes at the time it was built, and because of its sturdy construction it is perfectly suited to carry the new 9-ton instrument. "We started this project by surveying large telescopes to find one that had a suitable mirror and wouldn't collapse under the weight of such a massive instrument," said Berkeley Lab's David Schlegel, a DESI project scientist. Arjun Dey, the NOAO project scientist for DESI, explained, "The Mayall was precociously engineered like a battleship and designed with a wide field of view." The expansion of the telescope's field-of-view will allow DESI to map out about one-third of the sky. "The telescope was designed to carry a person at the top who aimed and steered it, but with DESI it's all automated," she said. "Instead of one at a time we can measure the velocities of 5,000 galaxies at a time - we will measure more than 30 million of them in our five-year survey." The fiber-optic cables will carry the light from these objects to 10 spectrographs, which are tools that will measure the properties of this light and help to pinpoint the objects' distance and the rate at which they are moving away from us. DESI's observations will provide a deep look into the early universe, up to about 11 billion years ago. 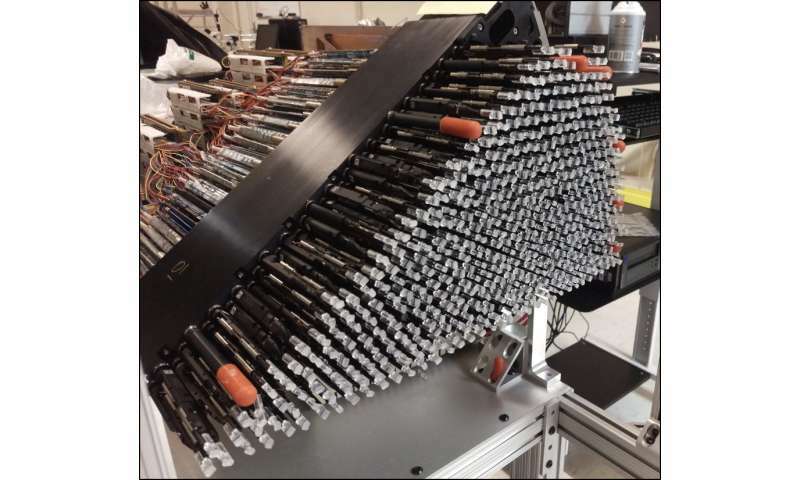 DESI will scan one-third of the sky and will capture about 10 times more data than a predecessor survey, the Baryon Oscillation Spectroscopic Survey (BOSS). That project relied on a manually rotated sequence of metal plates - with fibers plugged by hand into pre-drilled holes - to target objects. All of DESI's six lenses, each about a meter in diameter, are complete. They will be carefully stacked and aligned in a steel support structure and will ultimately ride with the focal plane atop the telescope. 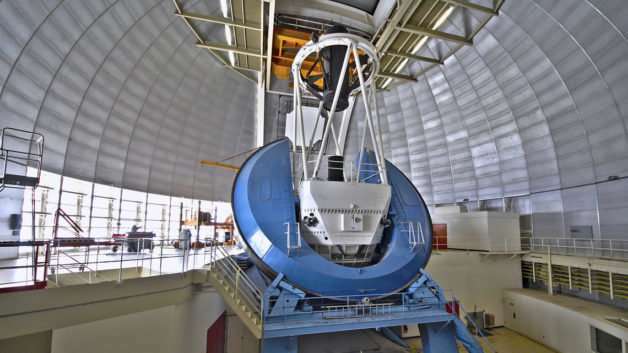 The Mayall Telescope has most recently been enlisted in a DESI-supporting sky survey known as the Mayall z-Band Legacy Survey (MzLS), which is one of four sky surveys that DESI will use to preselect its targeted sky objects. That survey wrapped up just days before the Mayall's temporary closure, while the others are ongoing. Data from these surveys are analyzed at Berkeley Lab's National Energy Research Scientific Computing Center (NERSC), a DOE Office of Science User Facility. Data from these surveys have been released to the public at legacysurvey.org. "We can see about a billion galaxies in the survey images, which is quite a bit of fun to explore," Schlegel said. "The DESI instrument will precisely measure millions of those galaxies to see the effects of dark energy." "This project is all about generating huge quantities of data," Levi said. "The data will go directly from the telescope to NERSC for processing. We will create hundreds of universes in these computers and see which universe best fits our data." Installation of DESI's components is expected to begin soon and to wrap up in April 2019, with first science observations planned in September 2019. "Installing DESI on the Mayall will put the telescope at the heart of the next decade of discoveries in cosmology," said Risa Wechsler, DESI Collaboration Co-Spokesperson and associate professor of physics and astrophysics at SLAC National Accelerator Laboratory and Stanford University. "The amazing 3-D map it will measure may solve some of the biggest outstanding questions in cosmology, or surprise us and bring up new ones." Dark energy is the outflow of dark matter associated with our universal black hole. I gave you a 1 fthompson495 because there is no peer reviewed science that supports the statement you made. Dark Energy, contrived to displace the 2nd Law of Thermodynamics, Entropy. I surmise these cosmologists imagine they are smarter than Nuclear Physicists who already know the 2nd Law of Thermodynamics cannot be repealed to accommodate concepts of Dark Energy. But of course what would Nuclear Physicists know in comparison to the funny farm pseudo-sciences of overage Trekkies? Oh well , on to 2050 and fixing the problem with our dimming Sun. @nrauhauser, our visible Universe is a larger version of the outflow associated with a supermassive black hole.